Toot's Harbour offers youngsters open-world gameplay as they help guide Toot around his harbour to meet friends from the popular pre-school series. Toot the Tiny Tugboat is entering the digital space with the first app based on the popular pre-school property. Lupus Films and Thud Media have partnered to launch the new app, titled Toot’s Harbour offering young fans open-world gameplay. 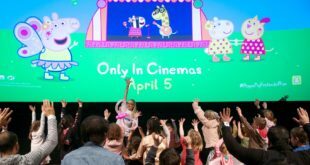 Inspired by the hit animated series that airs on Channel 5’s Milkshake and Cartoonito, the app will be tagged on the channel from Wednesday, April 15th and is priced at £2.99. Through Toot’s Harbour, youngsters are encouraged to improve their sea-faring skills as they help to guide Toot around the harbour to meet his friends, play games, tow boats and collect ducks and starfish rewards. The app even offers players a 3D interactive experience of Toot’s world, with music and familiar voices from the series. “We are really thrilled with the Toot’s Harbour app,” said Ruth Fielding, co-founder of Lupus Films. “Thud Media has done a fantastic job creating an easily navigable version of Toot’s world so children can fully immerse themselves in harbour life and play along with our tiny tugboat. Alongside its primary content, Toot’s Harbour includes two additional mini-games: I Spy – encouraging players to view the harbour through the Harbour Master’s binoculars, and Towing Game – where players help tow boats to safety.